Who doesn’t love getting free stuff on their birthday? While friends and family may shower you with gifts, there are also plenty of places to get free stuff on your birthday. Birthday freebies include anything from free food to product coupons from your favorite stores. Retailers do this to earn your business and make you a repeat customer. Often, all you need to qualify to earn free stuff is to let the business know it’s your birthday. If you have an upcoming birthday, or know someone who does, use this list to score some free items. If you plan on being out and about for your birthday, use it to your advantage and get something for free. Each retailer has different requirements, but it often doesn’t take much effort to get freebies for your birthday. 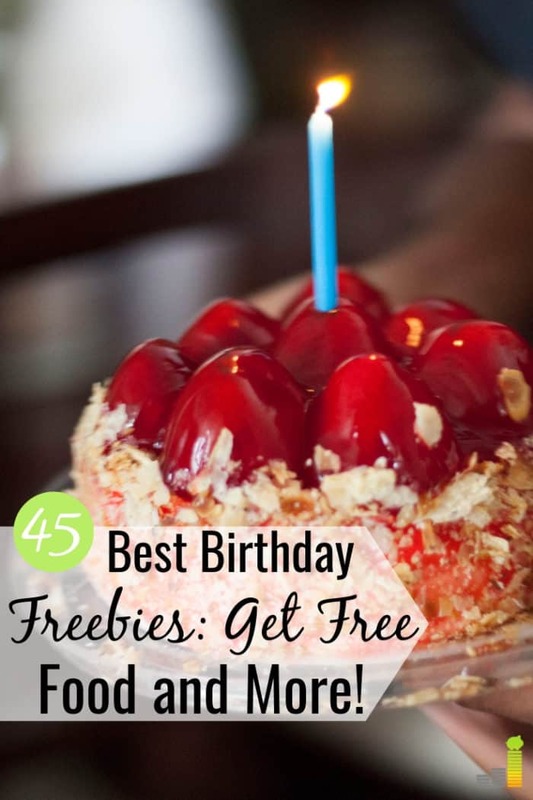 In this post, we share the 45 best places to get free stuff on your birthday. The most common item to get free on your birthday is food, and who doesn’t like free food? Below are the best places to get birthday food freebies. Like root beer? You’re in luck. If you sign up for A&W’s Mug Club, you’ll get a free root beer float on your birthday. When you sign up for the free AMC Stubs program, you’ll get a free large popcorn on your birthday. If you upgrade, you’ll also receive a large fountain drink. If you sign up for Applebee’s email club, you’ll get free food on your birthday in the form of an appetizer, entree, or even dessert. You won’t know until you show up. Who doesn’t like free ice cream? When you join the Baskin Robbins email list, you’ll get a free scoop of ice cream on your birthday. Join My bd’s Rewards and get a completely free meal on your birthday, plus a $5 coupon just for signing up. After signing up for the Chef’s Table, you’ll receive a $30 birthday certificate during your birthday month. Legendary Irish hospitality? That just screams awesome birthday goods. Sign up for the Bennigan’s e-club and get a freebie on your birthday. Once you become a Bonefish Grill Insider, you’ll get a special surprise offer for your birthday. Also, don’t worry about keeping track of your emails; they can find your account via your phone number. You receive a free bagel with cream cheese when you sign up Bruegger’s Bagels Inner Circle. The birthday freebies don’t stop there as you also receive a gift on your special day. After signing up for Caribou Perks you’ll be able to enjoy a free treat on your birthday. How does free dessert on your birthday sound? With the My Chili’s Rewards Club, that’s exactly what you’ll get (plus some other cool perks). If you want a delicious birthday treat every year for breakfast, join the Denny’s Rewards family. Dippin’ Dots are so much fun! You can also get them for free on your birthday when you sign up for the Dot Crazy Email Club. Get your birthday cup of joe for free by signing up for DD Perks. When you sign up for Firehouse Rewards you’ll receive a free medium sub the week of your birthday. No ID required! Do you love pancakes? Do you love them even more when they’re free? When you sign up for MYHOP, you receive free pancakes on your birthday and on every anniversary of the date you joined. How does a free regular sub and 22 oz drink sound for lunch? if it sounds like something you’d enjoy, join the email club and get the offer via email. As an extra perk, the coupon is valid the entire year. While you technically don’t have to be the birthday boy or girl when redeeming your free donut, it would be a super sweet way to celebrate. Get a free donut just by signing up for Krispy Kreme’s email list. If you’re craving a steak on your birthday, you can follow it up with the free dessert that you get by signing up for Longhorn Steakhouse rewards. Sign up for the email list and receive a free burrito on your birthday. Per Moe’s, just don’t arrive in your birthday suit. Who doesn’t love noodles? Sign up for the Noodles Rewards app to get lots of noodle goodness. Plus, you’ll get rewards if you treat other people to lunch too. Win-win. As long as you sign up for the eClub, you’ll get a free appetizer or dessert. It doesn’t have to be your birthday, but it would be a nice way to celebrate. Joining Club Cantina gets you free queso on your birthday. You also receive a free order of queso or sopapillas just for signing up. Don’t let the cute name fool you. The Peetnik rewards will get you a free coffee on your first check-in and a free coffee of any size on your birthday. They also give you free coffee for every $15 that you spend. That a lot of free coffee. P.F. Chang’s means business when it comes to their rewards. When you sign up for their rewards program, you’ll get 1,000 points automatically (you need 2,000 for a free entree). You’ll also get a sweet birthday reward! If you love frozen yogurt, sign up for the Pinkberry Loyalty Program and receive a free frozen yogurt on your birthday. Pinkberry isn’t the only gives you a free frozen yogurt on your birthday. For $5 off your order, join Club Mango and get the coupon sent straight to your inbox to use on your birthday. Get a free burger during your birthday month when you sign up for the Red Robin Royalty Program. Not sure if you want a burger or something a little lighter for your birthday? Sign up for the So Connected email list and get a choice of either a free burger or garden bar entree. Want a free meal on your birthday? Look no further than Sizzler. Sign up for their Sizzler Club within a month of your birthday and get a free entree coupon to use. While the birthday rewards will vary, it’s still worth signing up for the My Sonic app for free birthday food. Rewards can range from a free drink to free tater tots (fingers crossed that you get your faves). You’ll get a free cupcake on your birthday when you join Sprinkles Perks. Starbucks gives you a free single-serve coffee drink or a food item of your choice on your birthday. You do need to sign up for their rewards program at least 30 days prior to your special day. The program is free to use, and if you’re a big coffee drinker, you probably use it already. Join the Steak ‘n Shake Rewards Program to receive a free milkshake on your birthday. When you join Club Fondue, you’ll receive a free gift on your birthday and six Melting Pot signature chocolate-covered strawberries just for signing up. Whataburger is a classic fast-food staple down South. Celebrate the Southern charm by signing up for their email list and getting a free hamburger on your birthday. When you join the Wiener Lovers’ Club, you’ll get a free coupon for your birthday, plus a free chili dog just for joining. Sign up for Zax Cub to get a free sandwich meal after joining and a free Nibbler on your birthday. Food isn’t the only free item you can receive for free on your birthday. Below are several non-food birthday freebies available on your special day. Who doesn’t like to watch movies for free? If you want birthday freebies near me, then look no further than Redbox. When you sign up for their Redbox Perks program, you receive a free one-night DVD rental on your special day. Love makeup? Become a Sephora Beauty Insider and receive a free gift for your birthday, plus access to free beauty classes. With the Friends and Benefits Program, not only will you get 15 percent off after filling out your profile, but you’ll also receive a free gift. It can get expensive to shop at ULTA Beauty, but a birthday gift for free from them will save you money. Receive yours when you sign up for ULTA’s email list. Aveda is a skincare store that specializes in natural products. When you sign up for their rewards club, they give you a free gift -valued at $23- on your birthday. It does cost $10 to join their program, but the free gift outweighs that cost. Do you like free money? If you do, sign up for Ace Hardware’s rewards program and receive a free $5 gift card on your birthday. If you’ve shopped for a greeting card, you know how expensive they can be. When you join the Hallmark Crown Rewards program, you receive a voucher for a free card and 20 percent off any item. Use the card the next time you need one, and save money on something for yourself. Sign up at least a month or two before trying to redeem your reward. If not, you may have to wait until the next year. Check the fine print. Will you need to show your ID? Do you receive the gift on your birthday or during your birthday month? Do you have to buy something to get your freebie? These are all questions you need to have answered before giving these companies your email or personal info. Follow the rules. For some places on the list (like Starbucks) you need to be a member who makes regular purchases. Don’t sign up for these if you don’t plan on using them. You’ll just end up wasting money, not saving it. Unsubscribe if you have to. Once you receive your birthday reward, if you don’t want to be tempted to spend extra money, feel free to unsubscribe from the email lists. You can always sign up again later. You may want to use an email different than your main address. This will help avoid filling your inbox with ongoing offers. 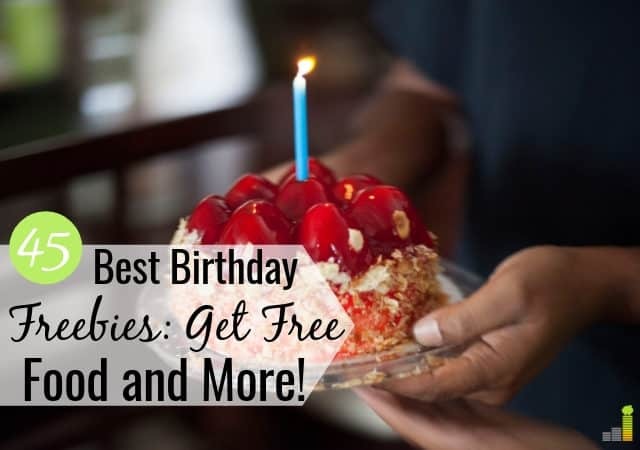 There are countless places that offer free birthday rewards, and some awesome gifts that you can receive on your birthday just for joining an email list. This year for your birthday, see if you can go the whole day without spending any money at all on food or treats! What are some of your favorite birthday freebies you’ve received in the past? What best practices do you follow to take advantage of free offers? Let us know where you get freebies on your birthday and we’ll add it to our list.